I would like to invest in FD or any other instrument where the rating of the institution is AAA and I shall get the interest in every half year / year without hassles. I am a senior citizen. It may be FDs of state/central govt, banks other NBFCs with AAA rating. Any past experience with that institution will be appreciated. The interest rate should be +-10 %. Is ESAF Small Finance Bank safe to invest? We appreciate your valuable support to update the Bank Interest rate according to latest changes of 05 Feb 2018. 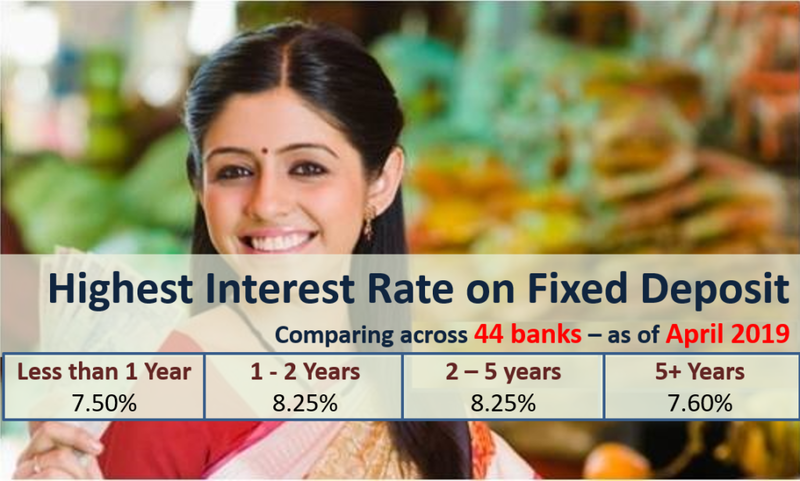 As search on online i found Bajaj Finance offering highest interest rate on fixed deposit in comparison of Banks that is true? if Yes so it is save for investment? Yes you can invest in bajaj finance FD. Here are some more companies you can look into. Is IDFC bank safe for fixed deposit? Is it safe to have Fixed Deposit in Standard Chartered Bank? Are u sure the FD interest rates here are for real ??? For example, the Standard Chartered Bank only offers 1.3%/pa for amount >S$100,000 for one yr. How come & not >7% as stated in the abv table ??? This is for Standard charted India. You can refer to their India website. Oh, I see. Which url can I then see the various bank fd interests in Singapore for comparison ? We only cover Indian market as of now! Hi sir myself chandan mitra, i want to know if i get interest more than 10000 per financial year in FD, so what to do save my money from TDS deduction? and suggest invest plan to get 1000000 in 15 years may be invest in lumsum or SIP which would be more safer. kindly help thanks. Cooperative banks are riskier than Government and Private banks. I cannot comment on PMC specifically. Equity based mutual funds invests in stocks and so their returns are linked to stock markets. If the broad market falls there are high chances your equity mutual fund would fall. Debt funds on the other hand depend on interest rate movement. In case interest rate rises the debt mutual fund falls and vice-versa. However there are mutual funds like arbitrage funds, liquid funds which are relatively safe and have returns similar to fixed deposits. Tell me about loan against FD is better option or Home loan is better considering interest rates. i am plan for rs 1000000 inwest in fd and save tex.any other option aveleble to ern profit in safe garrented mode of inwest,please sajes me. For tax saving options you may choose from the list in the link.